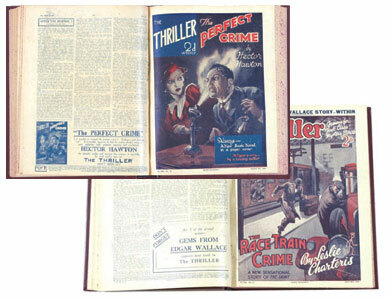 When we held our February 1999 live auction at Chelsea Town Hall in London, one of the stars of the show was a collection of bound volumes of The Thriller detective story papers from the late 1920s which contained stories by Agatha Christie, Leslie Charteris, Edgar Wallace and John Creasey. In very fine to near mint grades, the first twelve volumes enclosing issues 1-308 sold for £1,745.00. These same volumes were consigned to our June catalogue where, offered as one lot, they reached an impressive £2,500.00 before travelling half way around the world to occupy a prominent position in the library of their delighted new owner. 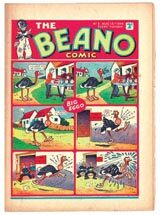 The early Beano comics continue to be strongly contested and after the world record price for number one in our December 2002 auction; a shabby number two reaching over £900.00 in March; it was no surprise that a number three in fine grade would do well in June. In fact it sold for £1,650.00 from a catalogue estimate of £1,200-1,500. 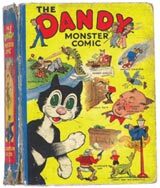 At the other end of the grade spectrum, a worn Dandy Monster Comic first issue from 1939 was offered with “extensive doodling” to the annual’s back and front inside boards. To be precise, mummy’s little darling had taken a paint brush and some bright red paint inscribing “THE BEGINING” (sic) and “THE END” in capitals somewhat bigger, but not quite as neat as these! We graded the annual as [good] and it finally sold for £1,210.00, the new owner not in the least bit concerned about its childish defacement. By contrast, there is a high grade version of Dandy Annual No 1 consigned to our September catalogue so it will be interesting to chronicle the bidding at this more rarified level. The last time we offered a high grade copy was in March 1996 when a fine plus example sold for £3,611.00, a record price which still stands today. Over at Space Fleet HQ, our Eagle No 1 in very fine grade took a reasonable winning bid of £550.00. Eagles are still widely available; the first print run was reported to be 900,000 copies, a huge amount in 1950, and many collectors hung on to them. The highest price we have recorded for a first issue is over £800 some years ago, but recently the early issues from 2-10 have begun to climb in value in a range of £25-40 each, but only in higher grades. 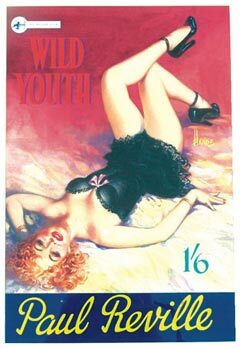 Reginald Heade’s artworks for sleaze paperback publisher Archer Press continue to find a strong following in the US and “Wild Youth” was no exception, his seductive cover commanding a £1,530.00 winning bid from New York state. Talking of US interest, our Captain America #1 reprint by UK publisher L. Miller (actually a complete reprint of US Cap America #77 in black and white) was contested to £123.00, an English collector finally triumphant over some concerted American bidding for this [vg] copy. With the obvious scarcity of the Golden age originals, the UK reprint market is an area set for expansion and an American collector acknowledged this by picking up our reprint Human Torch #2 (U S #38) for what may well be seen as a bargain £35.00. By comparison, over in the US section of our catalogue, a war-time Human Torch #7 with Alex Schomburg cover art of Yank-pummelled Japs fetched the upper end of its estimate, £198.00, with ease. The spine was restored and the centre pages were loose and edge-taped. Similarly, a good graded copy of Superman #4 (1940) with detached cover and tape pieces to its spine made an above estimate £364.00. In their way these complete and enjoyable Golden Age low-grade keys represent good value for money as in high grades you could easily add a zero to these figures. Puts the L. Miller UK reprints into perspective, doesn’t it? I wanted to write some more about UK reprints and stuff but my ten-year-old nephew has told me that the few people who might actually read this report would be feeling quite tired by now and it’s high time we got organised for the Hulk movie which is in our local cinema next week. Truthfully, it’s me who wants him there as credible cover as we debate with the ticket seller the advantages of armchairs up at the back (tick), or neck-ache and deafness at the front (cool). Whatever happened to the one-and-nines, the National Anthem and that bloke who played a big piano…? Would you like to be reminded by e-mail when auctions open and close? Click here.